If there were paradise on earth, it might look somewhat like Bamiyan (see images). Here is a green high valley (over 8000 ft), bounded by ochre cliffs. Tall mountains flecked with snow stand to the north and south. The flat cultivated bottomlands are dotted with mud-brick farmsteads, each a toy fort with watchtowers in the angles; and a river runs through it. The sense of apartness may have been what drew Buddhist monks here, to build a large monastic center watched over by those colossal statues of the Buddha staring out from the cliffs. But Bamiyan was never out of this world. A major trade route passed through the valley, linking Central Asia with India and bringing both wealth and turmoil. The forts and guard-towers at every strategic spot are there for a reason; and those ruins up on the plateau are the legacy of the Mongol’s fury. The mutilated Buddha statues lost their faces to the zealotry of Aurangzeb’s soldiers in the 18th century, and were eventually blown up by Taliban zealots in March 2001. Afghan history is not for sissies. The rise of Bamiyan is part of a bigger story, the Buddhist conquest of Central Asia, and that in turn was linked to the political and economic currents of that time. Briefly, early in the first century C.E. a semi-nomadic tribe called the Kushans swept out of Bactria, overpowering the rulers of the hill-tribes and what remained of the Graeco- Bactrian kingdoms. They established a large empire that endured for three centuries and reached from the shores of the Caspian Sea deep into northern India. Among its principal cities were Kapissa, just north of Kabul, and Peshawar in Gandhara (Pakistan). The Kushans made themselves the unavoidable middlemen between China, India and Rome, and prospered on the revenues of the Silk Road. And they fostered a syncretic culture, in which tribal traditions from Central Asia fused with artistic conventions derived from the Hellenized Mediterranean and with the powerful creed of Buddhist India. Buddhism was by this time in an expansionist mode, offering religious practices that spoke to the masses and an appealing style of illustrative art, backed by the subtle philosophy of the Mahayana sect. The sculptors of Gandhara had discovered ways to give concrete form to the doctrine--the deified Buddha, the incidents of his life and the boddhisattvas that complement the central figure. Every museum of Asian art displays representative examples of Gandhara sculpture, which is popular in the West because of its distinctly western idiom ( “provincial Roman “, some critics grumble, not without reason). The Buddha statues of Bamiyan, with their Roman draperies, belong to the Gandharan universe. And so do the numerous stupas scattered throughout the Afghan mountains, built to house relics of the Buddha and of later saints. Guldara, in a remote valley southeast of Kabul, is a noteworthy example with Hellenistic features; a more typical one is the stupa of Tope Darra, in the mountains north of the city ( see images). The valley of Bamiyan runs east to west for some 30 miles, flanked to the north and south by the 15,000-ft peaks of the Hindu Kush and Koh-i-Baba ranges. 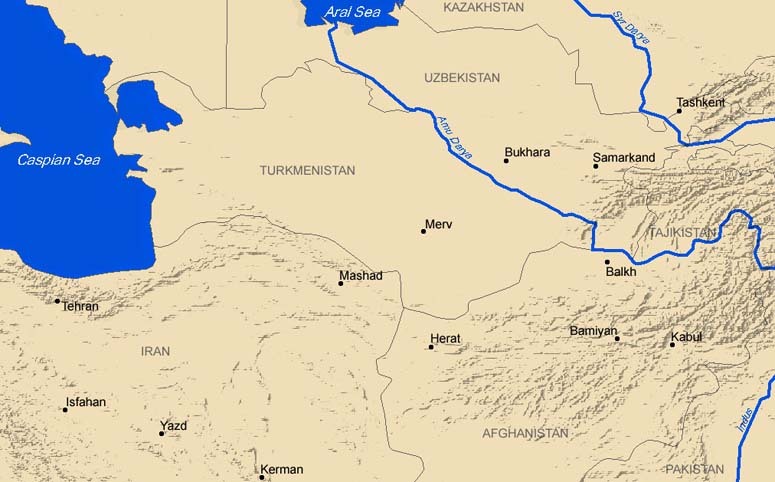 It made a natural corridor for migration and trade, and still affords a relatively easy passage between Kabul and Turkestan. Buddhist monks probably settled there early in Kushan times, and Bamiyan quickly grew into a major monastic center, repeatedly mentioned in Chinese texts from the fifth century C.E. onward. The pilgrim Fa Hsien passed through in about 400 C.E., and witnessed a ceremonial conclave of a thousand monks in the presence of the king, whose largesse is duly noted ( Fa Hsien also makes a point of the sacred relics kept in Bamiyan: a tooth of the Buddha, and his spittoon; cited in Dupree, 1967). The celebrated traveller Xuanzang visited in 632 C.E., and described that same solemn assembly. He was impressed by the monk’s devotion, and mentions the giant standing Buddhas. A century later a monk from Korea, Huichao (727 C.E. ) describes Bamiyan as an independent Buddhist state, perhaps under Sassanian suzerainty. An indigenous dynasty that adhered to Buddhism as best it could survived in these mountains until 970 C.E., when the rulers of Ghazni (in southern Afghanistan) imposed Islam on all their domain. Muslim kings then ruled for another two centuries, their reach at times extending to the Oxus river. Their residence was the large city on the plateau facing the two Buddhas, whose ruins are now known as Shahr-i-Gholghola ( variously translated as the City of Silence, or of Screams). Bamiyan was protected by watchtowers and by two massive outlying fortresses, but when the day of reckoning came nothing could deflect the storm. In Bamiyan, as elsewhere in Central Asia, apocalypse came at the hands of Ghengis Khan in 1221 C.E. Ghengis sent a small army to seize the valley, commanded by his favorite grandson. When the boy was killed by a bowshot from the fortress of Shahr-i-Zohak ( the Red City), the Khan vowed implacable revenge: no human or animal would be allowed to live. As always in these matters, Ghengis Khan was true to his word. Neither the city of Bamiyan nor its outliers were ever rebuilt; their ruins stand today as mute testimony to the human capacity for savagery. Recovery would be slow. Forty years after the disaster, Juvaini found Bamiyan still a ghost town. Rebuilding took place in the 15t century, under the Timurid kings; Babur, with his keen eye for natural beauty, was much taken with Bamiyan. But by then the caravan trade was in terminal decline. As an agricultural and pastoral region, the valley became a stronghold of the Afghan monarchy; and eventually caught the roving eyes of a new breed of pious pilgrims, the serious travellers. The magnet is, or rather was, the gigantic statues of Buddha carved out of the cliff. One stood 120 feet tall, the other 175; each occupied a trilobed niche whose arches were decorated with colored frescoes. In their day, the statues too were brightly painted. The niches are flanked by dozens of artificial caves, many adorned with frescoes, all part of that huge monastic ensemble. Scholars have discerned stylistic influences from Gupta India and Sassanian Iran, and these allow one to venture some dates. The Buddhas are presently assigned to the 5th and 6th centuries C.E. ( earlier authors often preferred dates a couple of centuries earlier, e.g, Dupree,1967). Some of the painted caves may be later still. Neither the monasteries nor the royal city at the foot of the cliff has been excavated, but visitors found much food for thought in the Islamic city ( Shahr-i-Gholghola) and its outlying fortress ( Shahr-i-Zohak). Presently, it is said, both are still packed with landmines; Ghengis Khan would be pleased. For a brief summary of the history of Bamiyan and its monuments see the article by X. de Planhol in the Encyclopaedia Iranica. For the Kushans see J. Keay, India, A History (Grove Press, New York, 2000). There is a good survey of Gandharan art in R.E. Fisher, Buddhist Art and Architecture (Thames and Hudson, London, 1993). During our visit to Bamiyan in 1970 we relied on a small guide by Nancy Hatch Dupree (The Valley of Bamian, Afghan Tourist Organization, 1967). Silk Road Seattle is a project of the Walter Chapin Simpson Center for the Humanities at the University of Washington. Additional funding has been provided by the Silkroad Foundation (Saratoga, California).